Because of the work of action groups, big corporations are being encouraged to stop throwing away waste food and feed people with it instead. Jemma Crew reports. The first day of April was hot, bright and sunny in Brussels. This was a surprise for Brussels – it's usually grey and rainy this month. But last Tuesday was also unusual for another reason. 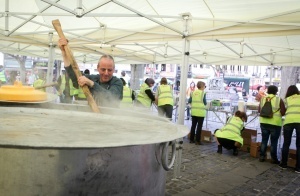 At lunchtime, more than 6,000 meals were served to city workers, locals and tourists – completely free. 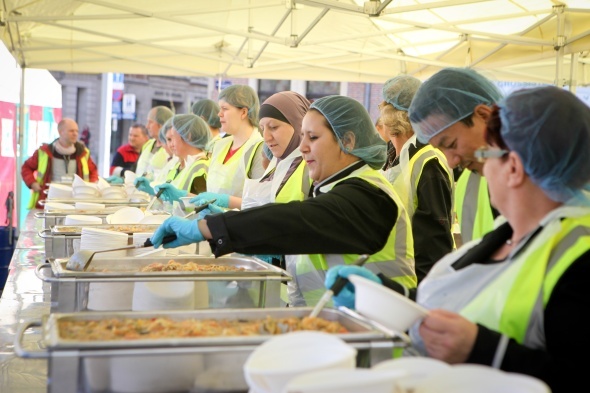 The event was one of many in cities over the world in the last five years, organized by the Feeding the 5000 campaign and others. Before the meal, volunteers prepared more than 750 kilograms of leftover vegetables from many farms: in Belgium and as far away as Kenya. If they hadn’t used them, the vegetables would have been dumped in landfills. This big picnic is called ‘Filling bellies not bins’. It is trying to educate the public about how to produce, sell and use food on a global scale, but not waste it. Tristram Stuart started the campaign. He says it tells the people who make decisions that the public do not want any more food waste’. Making a meal out of nothing? There is enough food to feed the world 1.5 times, but 1 in 8 people are going hungry. This is shocking, but wasting food that people could eat is not only an ethical problem. Food is expensive to destroy – it uses a lot of water, land and other resources, so this has a very big effect on the environment. As food breaks down, it produces methane – a greenhouse gas that warms the planet 21 times more than carbon dioxide. There is similar waste across the whole supply chain, from farms to dinner tables. This is because of many reasons: eg. people do not know enough, packaging is not suitable for transporting and storing food. Businesses say that most waste is in homes, but they say this to stop them feeling responsible from looking at their supply chains; the truth is that most waste happens before food gets to the shops. In Kenya, they grow green beans of different lengths; then they cut them to fit into boxes to transport them to Europe, and throw the rest away. They throw away perfect fruit with a dark mark because it does not reach the perfect standard that supermarkets demand. And when the predictions are not right, or supermarkets cancel orders, the farmers have to throw away all the food they spent months growing. For each European citizen, about 179 kilograms of food is wasted every year in the supply chain and at home. About a third of food for humans is wasted globally – about 1.3 billion tonnes per year (from the Food and Agriculture Organization). Because of this, the EU (European Union) are now slowly doing something. In 2011, the European Parliament passed a resolution on how to stop food wastage. A Roadmap to a Resource-Efficient Europe was started in 2011 and the European Commission will produce a Communication on Sustainable Food in the next few months. But some European countries are doing more. 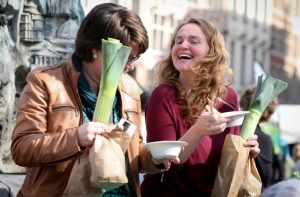 In Belgium, businesses do not have to pay tax on the leftover food they give to charities. 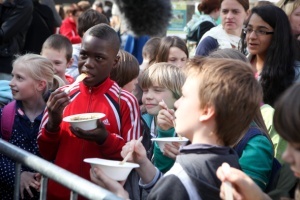 And some areas in Belgium now say supermarkets must donate food they don’t sell, not destroy it. Tristram Stuart says this is the best regulation on food since the Second World War. In Britain, the “Groceries Code Adjudicator Act” started in June 2013. It looks at the relationship between supermarkets and suppliers, and it makes sure there is fair treatment and it investigates complaints. Campaigners hope that this will mean that everyone in the supply chain will feel responsible for food waste, not just the producer. This would be fairer; it would also make sure the businesses make better predictions so producers don’t produce too much. And we can be optimistic. Last year, Tesco became the first supermarket in Britain to agree to make public their information on food waste. And other supermarkets have followed their example. There is a lot of competition, so when one business changes, all the others have to change too. When they are more transparent and explain openly, businesses have a good opportunity to be both efficient and ethical in producing one of the world’s most valuable commodities: food. Action at EU, national and corporate level is very important to end food waste. And this is not possible without support from the public. Niki Charalampopoulou, Managing Director at Feeding the 5000, says that businesses do not have to publish information on food waste. Tesco and others published information voluntarily, but only after a lot of pressure from campaign groups and because they need to please the public. Professor Olivier De Schutter, (UN Special Rapporteur on the Right to Food), in the European Parliament last week, said that ‘people now do not want to only be consumers and voters […] they want to be active citizens – they want to have democratic power by taking action locally’. The event last Tuesday was very popular. This shows the public really want to take control of the food systems and stop waste. If we want to see change, we need to become active, critical and informed consumers and start asking questions – loudly and publicly. We can choose to buy fruit and vegetables with strange shapes from different places, like farmers’ markets and we can promise to really cut food waste in our homes. Nearly 1 billion people in the world do not have access to enough food to live; climate change is more and more worrying; so wasting food is very wrong ethically, economically and environmentally. If we do not find a more sustainable, efficient food cycle, we will waste much more than food in the future. This page was last edited on 14 April 2014, at 21:46.